I wanted to take a minute to introduce you all to a fantastic company: Arvo. 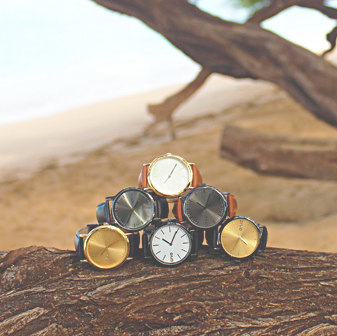 Arvo make watches that are made from genuine leather and feature a minimalist design. These watches are absolutely gorgeous, yes -- but what I want to talk about is the company itself. Arvo is a company with a mission to give back to the community. They want to start an uprising of doing good and making this world a better place. Arvo have stepped up to donate prizes for the Blogathon and also to the Turtle Power Auction that I am running for my friend Jenna's beautiful son, James. They are committed to doing good in any way that they can. The beautiful, high quality watches are a pretty awesome plus. I am enjoying making this post while my husband tends to dinner (which is enjoyable because I'm not so good at multitasking -- cooking dinner was just another wrench in my schedule -- but also stressful because I'm a control freak and have convinced myself he's just sabotaging my recipe) and wanted to take a minute to gush about this fabulous company. Like all of our generous Blogathon sponsors, I hope you consider them while doing your holiday shopping. As I mentioned, Arvo have graciously offered three of their watches to be raffled off during the Blogathon. I'm excited to pull the winners! I'm so excited!!! Thank you!